Over the last five years, Craig, age 38, had been living with leg and hip pain. He couldn’t sleep and simple things like sitting, walking, and lying down would send radiating pain down his leg. During that time, he had x-rays, an MRI, and had been to physical therapy, but nothing seemed to help the constant pain. The pain and inability to sleep comfortably pushed him to get answers. Then, one doctor took an X-ray from a different angle and discovered that Craig had an impinged nerve in his hip caused by an abnormal growth that had also torn the meniscus in the hip joint. The only option was hip surgery and Craig jumped at the chance for relief and to get back to doing things he enjoys like long boarding. When Craig went into surgery, the doctor discovered that the tear was worse than expected and was starting to pull cartilage off the joint. Craig was in for a long journey of a 12+-week rehab process. After so many years of living with hip pain, Craig was committed to doing whatever it took to not only recover from surgery, but to maintain the healthiest possible hips and body for the rest of his life. His doctor gave him permission to use an exercise bike the first day after the hip surgery. He had researched several stationary exercise bikes, but wanted something that didn’t take up space in his home and that he could also do at work or while he and his wife traveled. He wasn’t looking for a quick cheap bike, but a long-term quality exercise bike that fit his busy lifestyle. Craig, an experienced innovator with skills in innovation development and product innovation in the aerospace industry, searched for a portable exercise bike, but everything that turned up was poor quality and flimsy. That’s when Craig and his wife discovered Excy and purchased the XCS 260. Within three days after surgery, Craig was pedaling the Excy XCS 260 with the permission of his doctor and physical therapist. 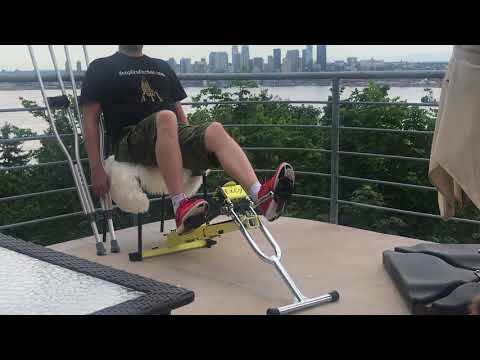 At first, Craig’s exercise pedal movements consisted of small back and forth motions with no resistance with Excy placed on the floor in front of his chair where the chairs legs prevented the system from scooting. The goal was simply to move the hip joint. Around week four, Craig was able to pedal with full rotations in the same position, but still at the easiest possible resistance setting. During the 6th week of the 12-week rehab program, he was given permission to pedal Excy at a comfortable resistance level that felt good with full rotations. Craig’s preference during this time was take Excy outside for fresh air on his balcony and to pedal primarily in a reverse rotation, while interspersing pedaling forwards. Even though he could only use Excy during those first 6 weeks to get movement, Craig noticed how quickly his body became tired in the beginning and how his endurance was building. He’s been able to build up to walking a mile without getting tired and now that he can use Excy with more resistance, he’s working on getting back in shape to long board on the sidewalk along Alki Beach near his house in West Seattle with his wife who rides rollerblades. Now at 12 weeks in his rehab process, Excy has helped Craig get the movement and cardio movements he needs to fully recovery from surgery. He’s sleeping again comfortable for the first time in five years and feels healthy again. During the winter months, Craig and his wife will be using Excy as a recumbent exercise bike, upper body ergometer, and full body trainer to stay active during the rainy months in Seattle. He can’t wait until his hip is strong enough to stand on Excy for unicycle and step cycle workouts, which he plans to use to build up endurance to run again in the spring of 2018. Sometimes it feels like you’ll never make it to a full rotation, but small movements help you get there. Here’s how to do it. Proper positioning is key. Here’s how to do it. Craig Is Working Way Up to the Unicycle Position! This is one of our most challenging moves and great for building core strength. Here’s how to do it. Always consult a doctor before starting a new exercise program. Always work with your physical therapist and doctor when using Excy with an injury.